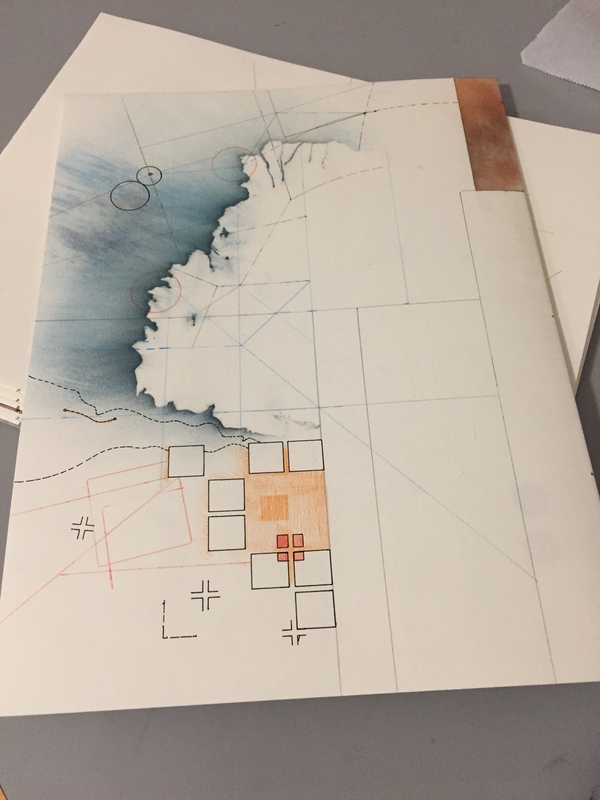 I recently introduced a new work, SCORE, which can be seen at the Lilly Library at Indiana University then posted a walk-through of the piece. …a few details about the creation of SCORE. Last winter seemed long, cold and dark and a perfect time to begin thinking about visual notation — not to think on it too much or overdo the research. It is one thing to see what’s been done and another to be beguiled by style or moves. The vortex of imitation must be avoided. At the same time, I’d begun exploring with Larry Ellingson whether my work could be used as a score for music. 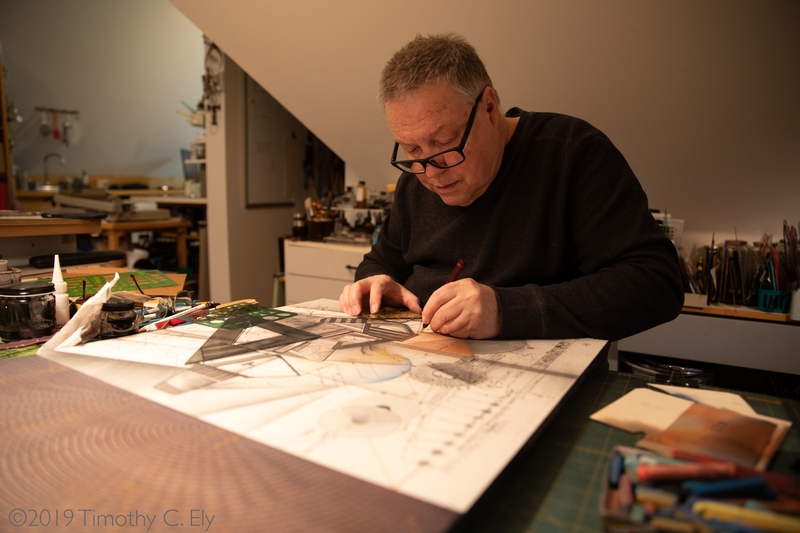 I gave Larry a gift of a drawing sometime before we nailed down our collaborative plot and he was working from it, examining the literal and intuitive approach so to see how it could work for him. I was delighted at his attention to the tiny details of my drawing and how he translated that into sound. I heard a debut with a detailed docent-guided tour by Larry last July during one of my workshops, so I knew it could work. 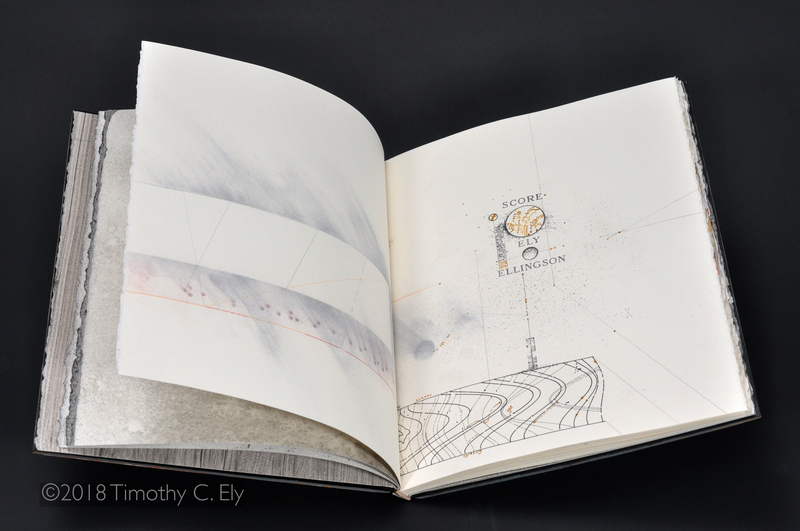 The book got a conventional start by selecting paper and soak sizing it with very warm gelatin size. Folios with sewing kerfs cut. Each folio was soaked for about fifteen minutes, blotted off on a clean towel and hung to dry. When the folios were dry but still cool, they were taken off the line, gathered and gently pressed overnight. As I remember, I tightened the press to consolidate the sections. I marked up the sections for sewing and added signature marks to nail down the sequence, in this case, numerals 1 through 6. 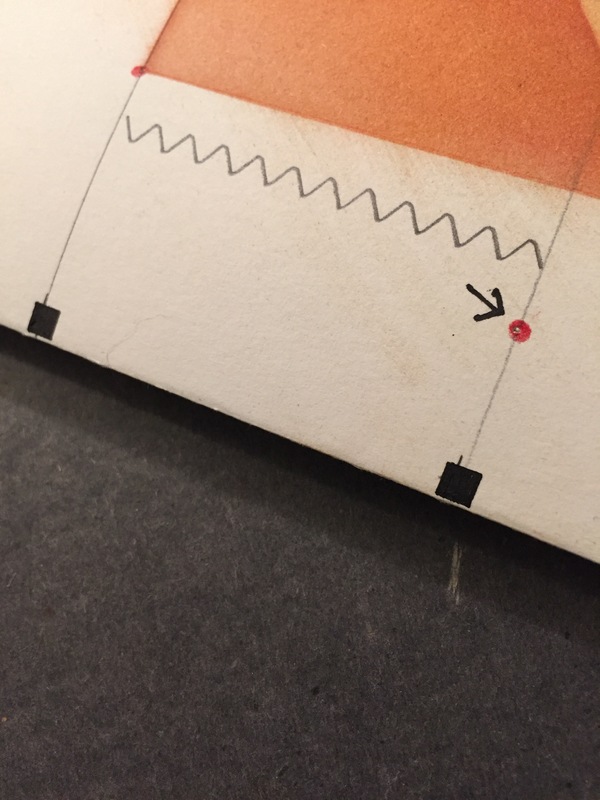 For this book, marking up for sewing meant I cut in the sewing kerfs — very small saw cuts where the thread will bind the book. I decided to also use those marks as points of departure for the drawings. It’s all very weird. My next step was a new exploration for me. At PBI * 2013, a student made a pivotal remark about the ecology between my sketchbooks and my formal books. I have been reflecting on that idea ever since. 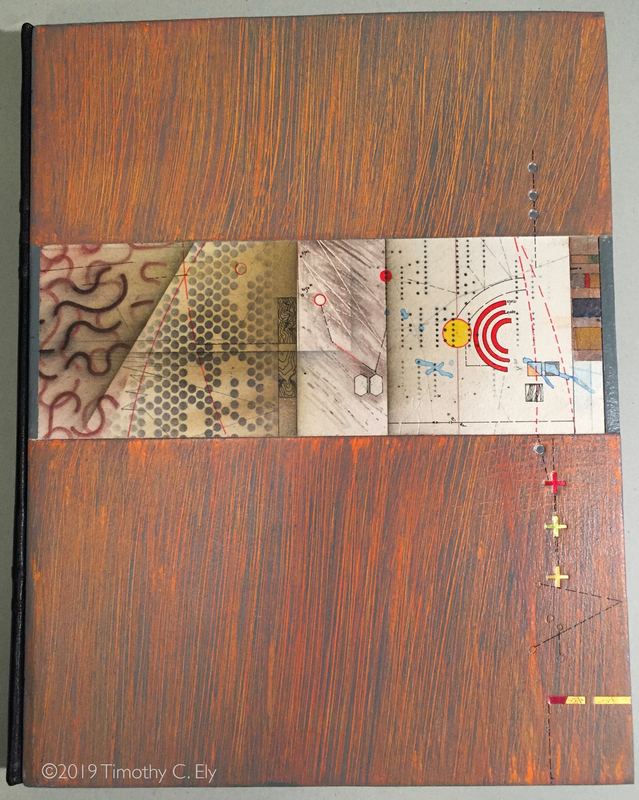 Reverse side of folio with “sketchbook thinking space” to establish idea for the page. What occurred to me was to merge or fuse the notion of the sketch or layout with the final page. I decided to put the sketch physically on the back side of the folio so that certain things, like a spray of triangles or geodesics, could be worked out. Along the way, pinholes were made so that eruptions of the pinhole would be visible on the working side. 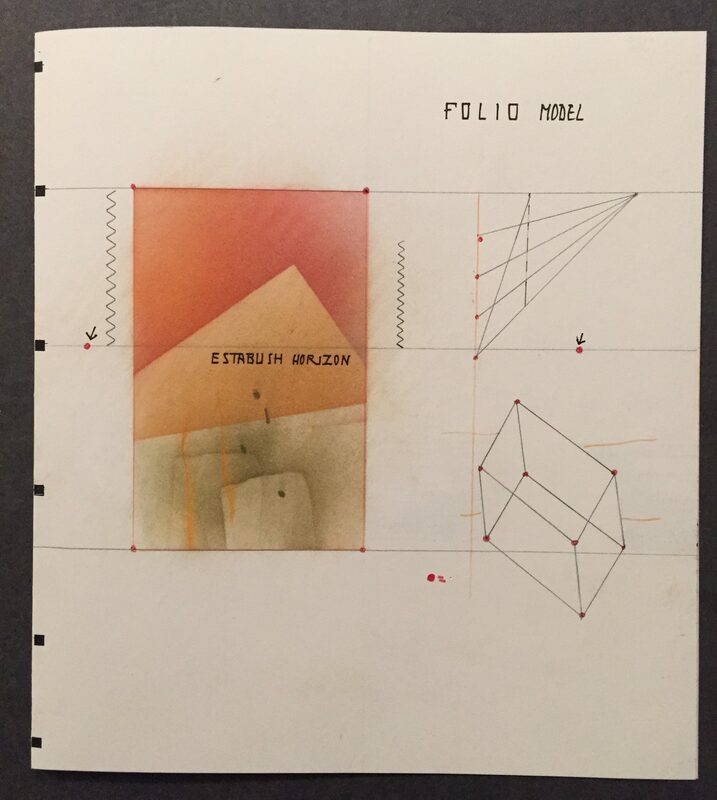 Inside (primary drawing) side of folio showing influence of sketches. 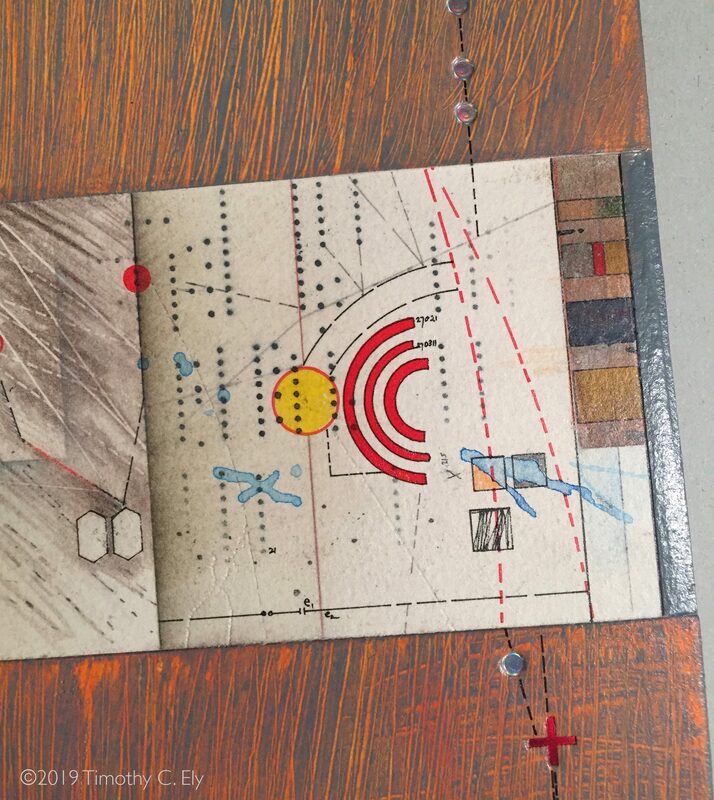 Early tests told me that a new innocence was born [the foundation of creatively connecting the dots] and that drawing on one side could physically and chemically [think ink and dye] bleed through to the formal side of the book page. I found it very exciting, strange to describe and easy to demonstrate. 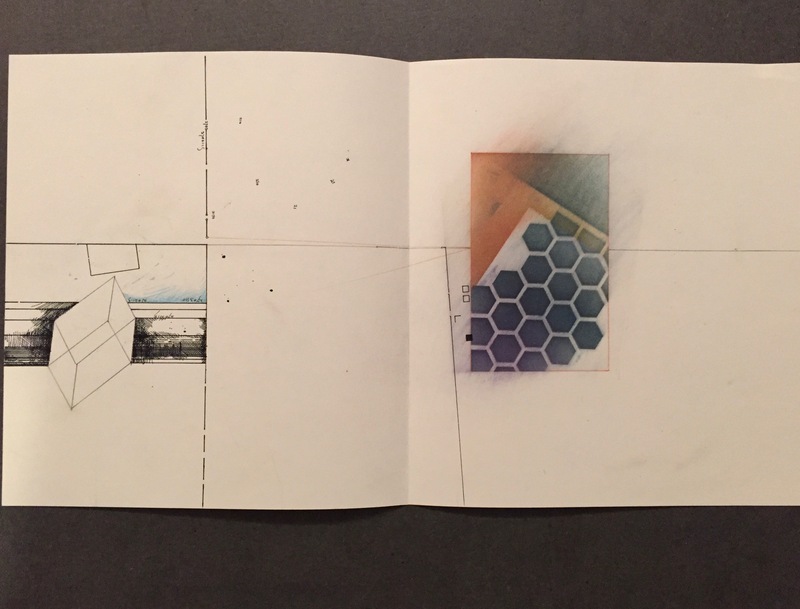 Each folio then for SCORE had a sketchbook thinking space on the back side of the folio with the actual score appearing on the inside. The fold changes the dynamic. The inner space is where the action is but a bit of the ideas and projections can be seen on the back side of the folio. The sketches, as I have always known, almost never fully describe what follows in the finished work. Sometimes, if an idea is really holding my attention, that structure will carry from the sketch to the finished and more refined work. 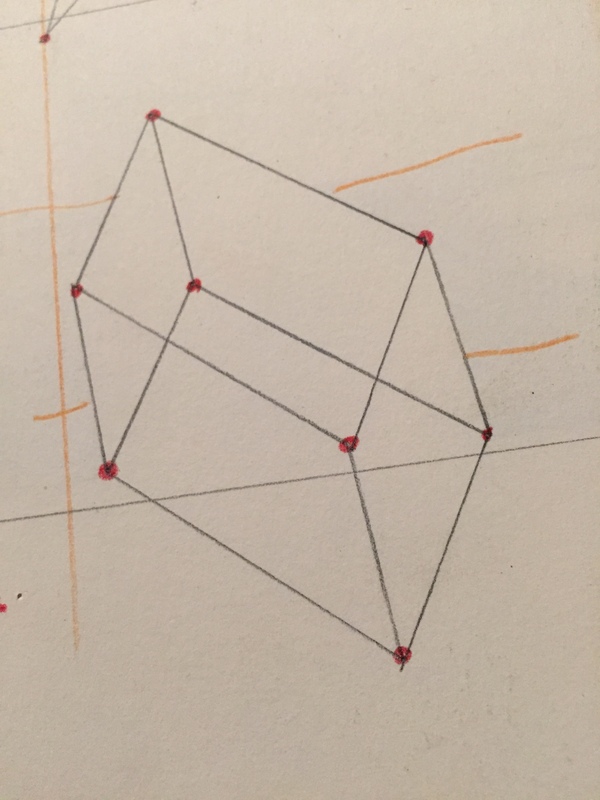 Sketches are really gestures towards thinking or, as in the case of an actual form [say, a triangle], can be pin registered to be echoed on the formal folio side. In other words, what was planned ends up utterly or deeply — there is the plan and then there is what happened. But this is the purpose of sketching in my work — to learn along the way to the finished folio. Sketch with pin registration at vertices. In this new approach, whether the sketching is visible in the final work depends on construction. 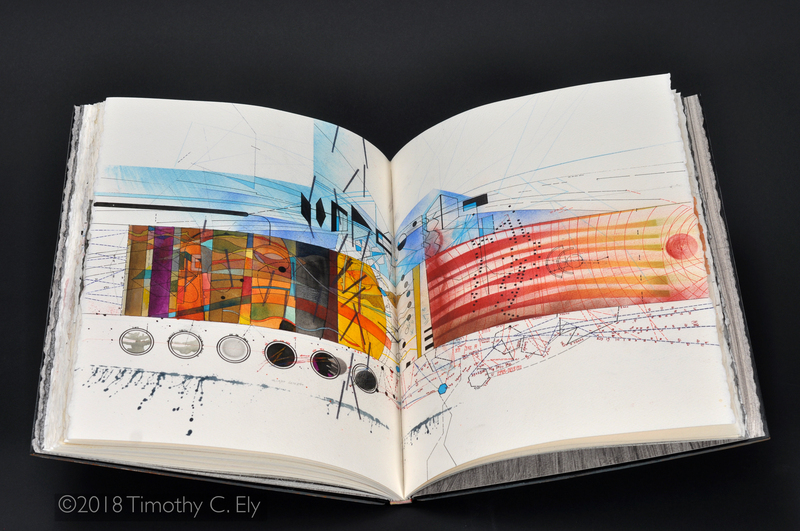 The sketching can all be visible in a sewn book or all concealed in a Drum-Leaf™ binding. Each folio in process was titled for reference. Thus Axis, Oort and the rest of the folio names were casually lettered on the sketchbook space, small layouts and geometric figures worked out and if done to scale and placement were pinned to show through and were then more fully rendered. This also is a perfect set up for layout of the perpendiculars by using the fold of the section as the foundation for the whole group of actions. Perfectly referenced grids align with the inner fold. 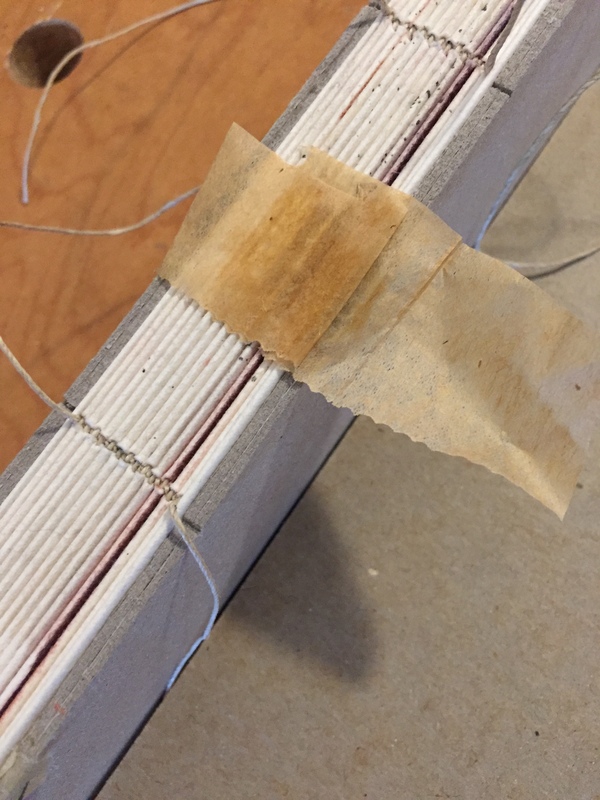 The physical binding is grounded in this fold as any binder knows, and this approach allowed me to exploit that even more than usual. Guiding perpendiculars from the fold. I also like to mark up for sewing beforehand by lightly gluing Japanese tissue over a couple one-inch spaces on the spine. 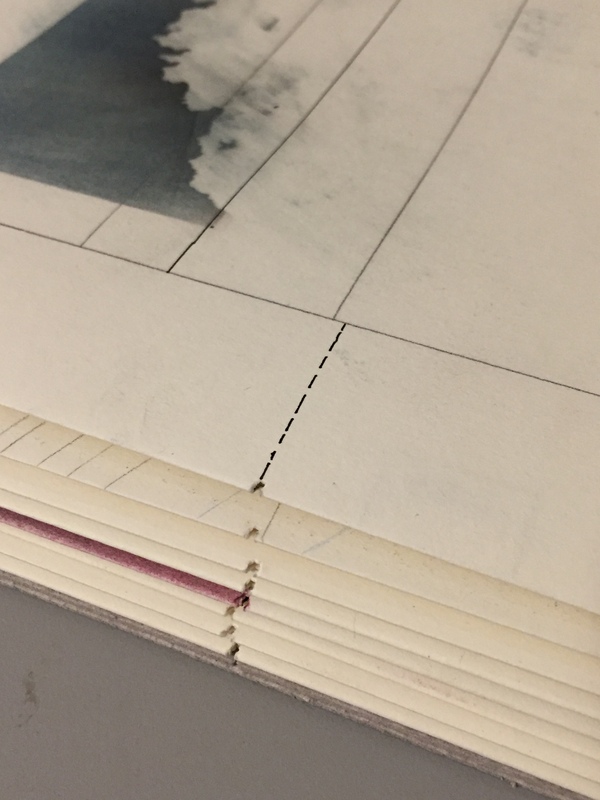 After marking up, the book can be trimmed and the edges treated or not. Doing this solidifies the context for the drawing space. I know precisely how large the book is and items like boards and linings can be cut ahead of time and reserved. Also, when marking up, I trimmed the edges and did some advance decoration — including around the sewing kerfs. The book at this stage is ready but is also easily be broken apart into single folios for drawing. Japanese tissue added to spine. Together, Larry and I culled through ideas for folio titles to anchor the music. We both had lists of resonant words and terms or locations or girls [Gloria?] or dinosaurs or auto parts or butterflies or Latin plant names or astronomical concepts. In the end we found Axis, Oort, Embryo, AMU [atomic mass units], Trace and Orion to be the set up for a field of concepts — loose enough for freedom yet solid enough to keep us on compass. The next step was taking these and designing a title page and index page. Now the commitment was really established and I began to draw. Yes, I worked the title page and index page ahead of the drawing. Drawing emerges guided by the fold. In my drawing, each move is a bit like a step on a tight rope. Each small decision is a move and affects each previous move. The world is nothing more than effect based on effect and as odd as it may seem, every move in the world is not disconnected. I feel this and so make my advances slowly so that I don’t have to do as much course correction as I once did. Yet, while habits and experiences support knowing of how to do something, novelty is still a goal to keep the finished work alive. With the layouts and general approaches at hand [a big drawing on the wall] I went to work. It was slow going at times as I had to listen. In my weird brain, when I play the guitar, I feel like I sense others playing with me. It’s strange and much like hearing voices. Usually I have a bass player at minimum or a guy playing second guitar parts. In the case of drawings, I was forcing a “synethesiac” effort by imagining what a sweep of line or pigment could translate into as sound. I did not have any kind of inventory of what Larry could generate. I suppose this could have been a handicap. But I had seen electronic music scores in the 80s and knew how many types of images can represent sound. The book was drawn to completion in September and photocopies of the scores were given to Larry. My efforts turned to binding. I designed endpapers to be vigorous but not overly illustrative since the book itself was nothing but illustrations. The book was sewn and forwarded as per conventional procedures. As a Planetary Collage Standard binding was to be employed, leather was prepared for the spine and pairs of boards laminated and pegged for the covers. Then it began to go south. Sometimes I think Doctor Zarkov down the street tests his dumb-guy ray gun on me. I managed to mis-measure one set of the board pairs and after laminating them saw that they were off far enough so that I could not use the pairs. So I started again with more care and a foil hat. The second time the design was good but they were so dull… boring. What began was the effort to save it all with various kinds of visual trickery. Yet, nothing I was doing worked and so those boards went onto the pile of other boards that failed. Start again. This time it worked. A morning spent asking myself ‘’What do you want to see?’’ was resolved by drawing. Drawing always works — coffee and drawing… Part of the process was to back off and simplify and allow elaboration to function as visual punctuation. The boards were carefully shaped and covered on both sides with print paper [0.018] turned in at the horizontal channel to double the thickness. Two more musical compositions were made for the boards, one layer thick, designed to sit just below the paper surface. Carefully as I could, they were fitted and adhered to the channel so that they sit just below the paste medium/latex painted spaces. Some ink lines and tooled emblems for cohesion finished it off, followed by a wax job. Finally the boards were attached to the book, always an anxiety filled event. Now I turned to the outer box I was creating to hold and protect the entire work. We had made a decision to use a conventional jewel case for the CD of music. That meant my outer box needed to hold both book and CD. It took over one hundred parts to make up just the lower tray supporting the book while keeping the jewel case below the waterline of entropy. My boxes always have 3 laminations and one along the top edge for a crisp finish on the walls. A basic tray is 20 pieces of many cuts… The surface of the box trays were coated with the same paste, latex, and pigment mix to echo the book. Simple…. I am fond of English Record buckram and bought a lot of once upon a time. The exterior of the box is covered in this. Finally, labels were applied. I make one-of-a-kind, stand alone objects. The books I make are singular forms — bindings containing a cluster of concepts. Being made the way they are rather defies multiplication so the books are never made as editions except under extraordinary circumstances. That said, my “one-of-a-kind” approach ran into a wrinkle this time. Given my working methods we chose not make a multiple book form. A very tiny abbreviation is found in the CD box. The book will remain singular and unique. We chose to produce CD copies of the music and, by extension, produce the folios of SCORE as reproduction prints. This recent practice of reproducing folios is designed so that books that have gone deep into secret collections (which tend always to be beyond sight) have a second incarnation. The prints and CD’s can be found on the merchandise page of the blog.